10-minute Garlicky Cauliflower Squash Bowls for an easy and delicious vegan bowl! Ever since I started eating meat again, I have been slacking on my plant-based meals. I crave quality animal protein more than anything else and I am all about listening to your body and what it wants. Over the past year or so, my body wants a lot healthy fats, protein and carbs. There are days that I crave bacon, eggs and avocado for lunch and others that I want an almond butter and banana sandwich on toast. Each day is different and I am trying to remind myself daily of this. If there is one thing I do not crave enough though it’s GREENS! I slack in the veggie department for sure. I am good for some zucchini and leafy green at night but its sneaking it into other parts of my day I am trying to be better at. 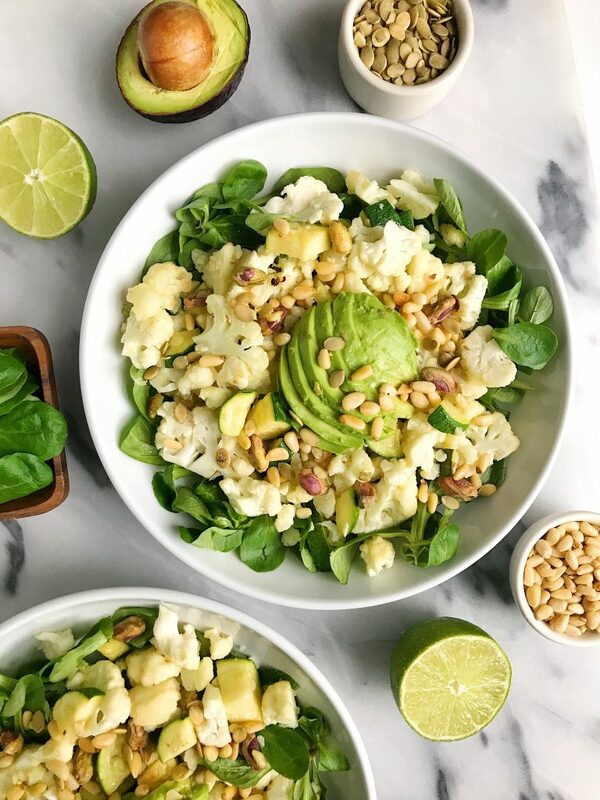 Like into my smoothie bowl in the morning or having a hearty salad with protein for lunch. That is where these Garlicky Cauliflower Squash Bowls come into play. They are filled with veggies, healthy fats and you can enjoy it as is or throw a piece of chicken or any protein you’d like on top. A pasture-raised egg would be delicious (just sayin!). What I love about this bowl is how many things we have going on. We have the greens as the base thanks to Organic Girl. And since their greens are triple washed, it saves us time in the kitchen when we are prepping our meals. 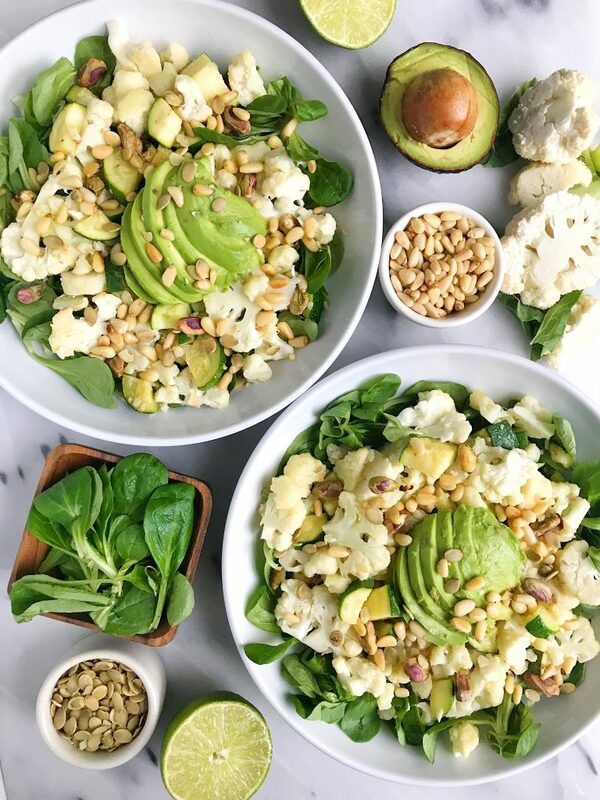 I love using all of their greens (arugula is my favorite!) but these mache rosettes are a fun way to use these unique greens. 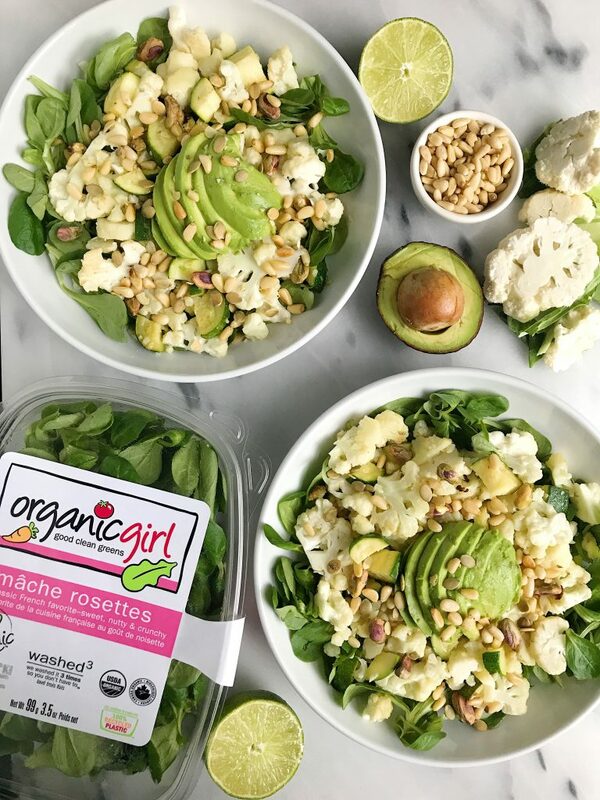 I have lost count of all of the Organic Girl recipes on the blog (click here for all my greens recipes!). I also added some zucchini, cauliflower and crushed pistachios, pumpkin seeds and pine nuts for a crunch. And of course some ripe avocado slices because I cannot have a savory bowl of eats without one! I hope you guys love this bowl as much as I do. It is easy enough to whip up to bring to work or school or make at home for a quick lunch. Let me know what protein you add on top too! I bet some grass-fed garlicky meatballs would be AMAZING.